Behold, a fruit fly trap that really works and doesn’t require a mechanical engineering degree. With my countertops buckling under the weight of ripe produce, the fruit flies have taken noticed and returned in a flurry. Ah but I have a secret weapon, a fruit fly trap that works, one that I fashioned while adhering to two of my favorite farm practices: use what’s on hand, and make it yourself. 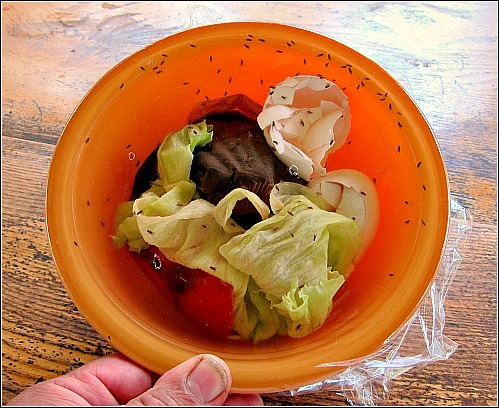 There are a bazillion DIY fruit fly trap instructions on the interWebs, but I’ve never found one that worked very well. Some required a scientific advisory board, NASA materials, and exotic baits, but the DIY Tall Clover Fruit Fly Trap is as simple as it is effective. And I bet dollars to doughnuts, you have the materials and skills to successfully pull this little how-to off . Cover bowl tightly with plastic wrap. Using a toothpick, make 2-3 holes in the middle of the plastic cover, each about the size of a grain of rice. Empty bowl when full, rinse and repeat. So just for the record, I am smarter than a fly. Thanks for this idea. They have been hovering around the trimmed bits of our tomatoes …gonna build one right now!! IT WORKS! HOORAY! IT WORKS! Your ingenuity has saved us from the hovering clouds of fruit flies (too much garden produce in the house). Wow, they do like fresh fruit! This is the easiest trap we ever tried, and we are practically jumping up and down, we are so thrilled to see the flies all congregate in there together. THANK YOU SO MUCH! Brilliant! We wish you all possible prosperity and happiness. Your invention will make many lives (especially in our fruit-fly plagued family) a little happier. Thank you, Tom!! 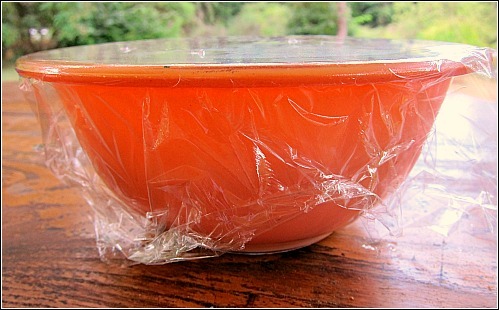 This is the method I use to capture fruit flies, and it works like a charm. I have tried various bait, including compostables, but their favourite seems to be apple cider vinegar diluted with a bit of water. I just love your sense of humor and writing style. You’re so fun. I’m SO grateful for this trap idea. We’ve been canning tons of fruits and veggies for the past two weeks, and the fruit flies are driving us CRAZY!!! We’ve even found them in our drinking water – gross! My son saw them flying up into the fridge water dispenser in the door. Sooooo disgusting. Thanks again for this simple-but-genius tip. Thanks for the tip! We were using vinegar and a paper cone with Saran Wrap, and my diabolica laughter didn’t last very long once I realized the flies were finding an easy exit. Renae, that’s what forced me to try something new and make this trap; the lame funnel and cone and foil and pop bottle contraption seemed more of a fun and easily escaped from maze for them. Great! I will be passing this onto others. 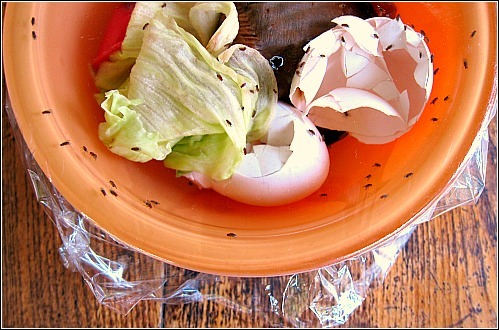 I made a similar trap – not as beautiful as yours – that had a little Pinot Grigio in it so the fruit flies could die happy! That’s a nice way to go, even for a fly. What a wonderful idea. I needed it a couple of weeks ago when DH peaches he bought had to sit on the table for several days to ripen up before I could make a batch of peach jam. I think I am officially finished with my canning today. Good idea. However maybe I’m a bit thick but wouldn’t just putting the produce and scraps away or covered up in the first place solve the problem also? This does work well, but as we have a compost bucket on the counter it just seems to multiply the little beasts. Found that if I leave a wine bottle, with 1/2 cup of wine in it, on the counter, the buggers do die happy, as they have to far to fly up and away, and they just might as well stick around for more swimming! Wendy I do believe your wine bottle solution is much more elegant and humane. 😉 I rarely have leftover wine around here, but should I, I will definitely give this a try. Though I must remember not to pour myself a glass later in the day; that would be for a textural experience I must prefer to avoid. Have to purchase a “fine” wine from Walmart for this experience. Not more than 3$, I think. Use the rest in cooking and salad dressing, then just leave some in the bottle without it ever tainting the tastebuds. Peel the lable off for a surefire way to not imbibe……cough, cough, hack! Tom, so simple that it is brilliant!. I have always taped a paper cone in the top of a jar with banana peels inside; it catches flies but not enough. I guess some found the way out. I will try your way the next time they show up. Thanks for the idea. Have been doing the same construction with some cider or wine vinegar or leftover wine (if you can fathom such a thing…) for bait. This has worked well for me for years. The NEW addition this year, which is a definite improvement, is the addition of a few drops of dishwashing liquid. It coats their little wings and the flies sink to the bottom of the bowl much sooner. Now, if you could come up with a death trap for sweet kitchen ants. “Terro” brings minimal results while the QUEEN remains. Have you tried cinnamon to keep them away? It does work but it can stain as well when it gets wet. I love it, Tom! You are my money saving guru! Nicely done! This should solve our fruit fly problem in our backyard. Tom…this sounds like the most perfect day to say goodbye to summer…might we still get a few more days??? Here is hoping! Meant to send this on your swimming post…oops…that is what happens when you have had a “too” long work day…sigh…wish I was going swimming! Hello, Tom. I just found your blog today and this is the post I landed on and really — I was not doing a search for — or even worried about — fruit flies. But I love your solution and it’s perfectly timed for us. We are being invaded by the little buggers and I have masses of peaches and plums to process in our kitchen. Tomatoes will be coming in today since we’re expecting a freeze any day now. I am going to try it. I have a jar with the paper funnel and vinegar plus a half a plum in it. It works so-so. There are alot of fruit flies in the jar, but they are just all hanging around where the funnel meets the mouth of the jar. I put tape all around that part because I noticed some of the flies were getting past the funnel right there. Anyway, I am going to try your method. I just have one question: what happens to the fruit flies that are trapped in your bowl? Do you let them go outside? If we did that, they would just fly right back inside. lol. Hi Maureen, Within 24 hours the moisture build-up usually takes out the fruit flies, but if not I just pop a big hole in the plastic and run the tap water in there and then shake the bowl, remove the cling wrap, and run the water down the drain and toss the fruit in the compost bin and start over with new fruit bits that come about from kitchen prep. My son taught me how to make these traps a few years ago and they’re the best. I usually use over ripe fruit and if I have any wine open, I add a dash, just so they die happy! I’ve got 2 going in my kitchen now..